"Always Trust in God and Remain Faithful unto Him"
Ravished Armenia was an extremely hard book to read because of the horrific content. It's so important that more people are aware of what happened to the Armenian Christians 100 years ago in 1915. 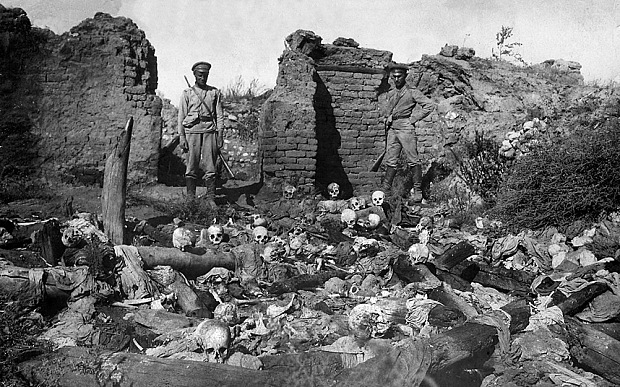 The Armenian genocide took the lives of 2 million, yet, it's not well known by the public, not taught in schools, and is denied by the Turkish government. I didn't know anything about it until a few months ago. Since then I've been trying to learn as much as I can. I have a pile of books about it, and each are going to be equally difficult to read. Even by WWII, the world had forgotten what happened to these people. 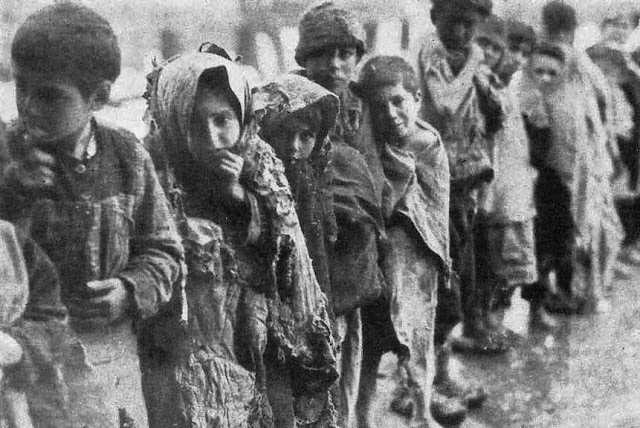 Adolf Hitler supported his argument that the world would forget the extermination of a people by stating: "Who does now remember the Armenians?" Isn't that remark frightening? 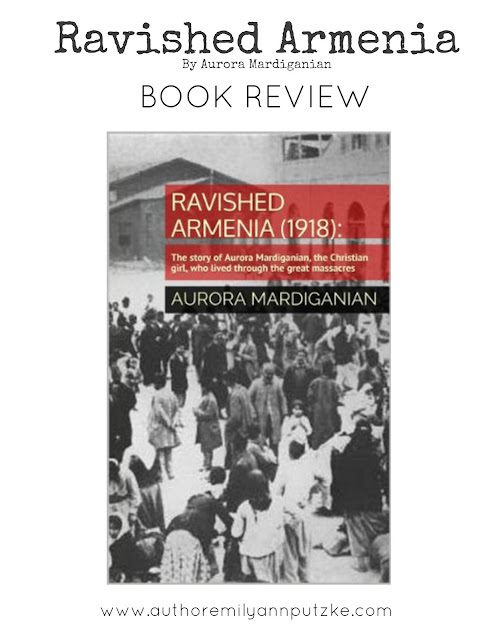 Ravished Armenia is a first hand account of a young girl who lost all her family members in the genocide. 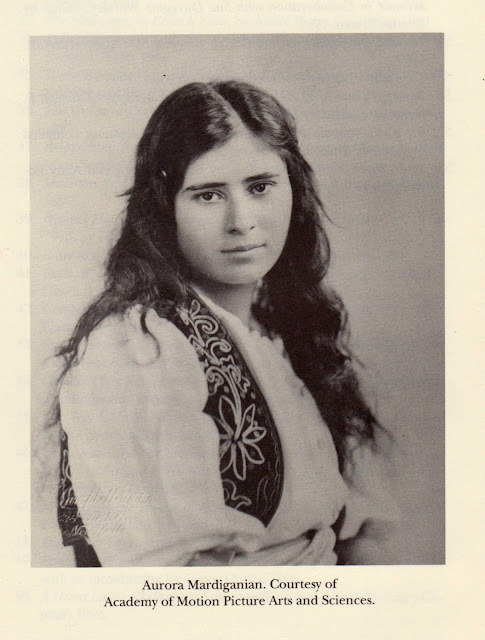 The horrors she went through are so difficult to read about ... the inhumanity of the Moslem Kurds and Turks is utterly incomprehensible. But through it all, Aurora remains steadfast in her faith. "I could not bring myself to deny Christ, after having remained faithful to Him for so long. I asked Him what I should do and His answer came, just as clear and direct as when I was about to use my knife outside the rocks of Diyarbekir. I seemed to see Father Rhoupen, the priest, and I even felt his hand on my shoulder again, just as when he said to me, 'Always trust in God and remain faithful unto Him.' I told the kalfa I could not forswear Jesus Christ." Aurora wrote this account shortly after coming to America, publishing it in 1918. A film was made about her experiences in 1919, and Aurora portrays herself in the silent film. This book shows us that history does repeat itself. The same thing is happening right now to Christians in the Middle East, and we must remember them. We must pray for them to remain safe and steadfast. Also, this book makes me want to learn more about Armenians, to remember them, and enlighten others on what happened. As the Statue of Liberty was pointed out to me as we entered the harbor, I rejoiced not merely because I, myself, was safe at last, but because I had at last reached the country where I was to deliver the message that would bring help to my suffering people. Here I found good friend — kindly Americans who have made me as happy as ever I can be. And, best of all, they are not being kind merely to one unfortunate girl—they are sending help to those I left behind—to those who are still alive and lost in the sandy deserts. They have made it possible for me to tell in this, my book, what General Andranik said to me: "America is trusting to her friends — the people of the United States." This book is definitely not for younger readers. Because of the content, I'd recommend it for young adults and adults. I read this on Kindle and the formatting was wacky and difficult to follow at times. Otherwise I would have given this 5 stars. I'm curious ... have any of you heard or learned about the Armenian genocide? That is so sad! I only just recently heard about it. There is a large Armenian communtiy where I live and there were actually billboards reminding people of what happened just recently. It is so sad. That's really good that your Armenian community was reminding people of what happened, though. My Grandma is Armenian. Her father still lived there when this was happening, and he was able to escape to America in time. It's a really amazing story -- he wrote it down and my daddy has it somewhere, but I myself have never read the whole thing. This is truly a horrific event in history. If not for my Armenian heritage, I probably wouldn't have known anything about it either. It's very important that we remember these people. Really?! That's amazing!! That would be really neat if you read/published his story! I have heard of this, because I'm partly Armenian too. I know that my Armenian great-grandfather immigrated to America in 1913, and ten years later went back to Europe to bring home a wife (an arranged marriage, I think), but I don't know how much they personally experienced of what happened in Armenia. I've read one historical fiction book on the subject, The Road From Home by David Kherdian—it's based on the true story of the author's mother. That's so interesting! I just got "The Road From Home" from the library, but I haven't read it yet. There are quite a few books about the Armenian genocide out there. I read about it in Forgotten Fire, by Adam Bagdasarian. The Turks were just like Isis, crucifying and burning. I just got that book from the library. It's true ... the Turks were just like ISIS. Last week I read a book called "Children of Armenia: A Forgotten Genocide and Century Long Struggle For Justice". It was my first major exposure to the Armenian genocide. I was horrified by the fact that although it was well known and main stream news at the time, it was forgotten as soon as remembering it fell out of line with America's political goals. That quote by Hitler made it all the more frightening. When I brought up the Armenian Genocide with some friends, NOBODY had even heard of it. A couple times I've had friends say that the only thing they know about Armenia is that the Kardashians are Armenian. Um excuse me? How could be boil down 1000 plus years of history, tragedies and triumphs, language and culture into one family's reality television show? I really just want to stand on my roof top and declare to the world: EDUCATE YOURSELF. THOSE WHO DO NOT KNOW HISTORY ARE DOOMED TO REPEAT IT. Anyhow, I'll try to spread my zeal for history in more acceptable ways. In the meantime, I will certainly be looking this book up! Great review. Excuse all my excess rantings. Oh, I just got that book from the library! Seriously, I raided all the libraries in the area for books about the Armenian genocide after reading this book. Yeah, it's so true ... those who can't remember the past are condemned to repeat it. And rant all ya want! I agree with you! I learned about the Armenian genocide years ago growing up, but I have only been slowly learning a bit of broader Armenian history in my researches into the medieval Levant. If you are interested in the genocide, though, one of the most staggering stories from the genocide was the story of the village of Ein Wardo, which I read in William Dalrymple's wonderful book From the Holy Mountain. I highly recommend it if you're interested in the Armenians. That struck me as being a story begging to be told :). Thanks for the book recommendation, Suzannah! I'll definitely look into it. Introducing ... a Historical Fiction Link Up! "Pack Your Bags, Fellas, War's Over. Amen."